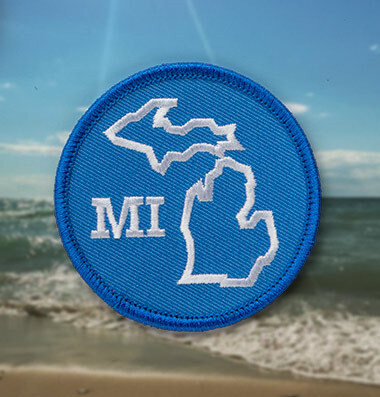 Draplin Design Co.: DDC-025 "Michigan Souvenir Patch" and "Michigan Decal"
Our “Thick Lined Michigan” design from our Michigan Torso Cover, just in patch form. 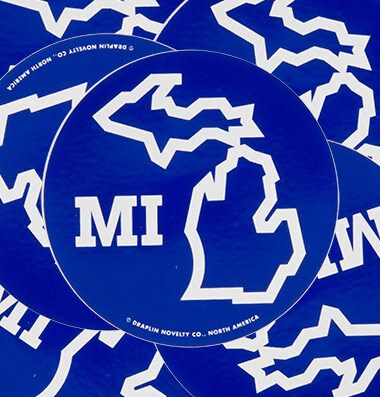 Say “Yes” to Michigan. Our home state. 04. Like a blue sky Michigan summer day. Can you feel it? And of course, in decal form. Once again, say “Yes” to Michigan. Band of the hand! 01. Proudly printed in the U.S.A.
02. Durable vinyl. Long lasting. 06. Manufactured by our Portland buddies at Diesel Fuel Prints. 07. Great for cooler, car, skateboard, notebook or party store window. Multiple uses.